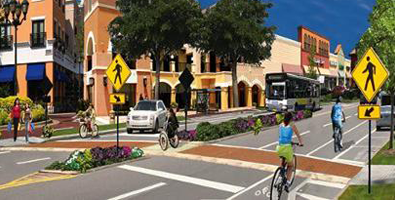 East Hillsborough Avenue, from Interstate 275 to east of 50th Street, was identified through the MPO’s Congestion Management/Crash Mitigation Process as an important multimodal corridor with persistent safety and mobility issues. In addition to serving as an essential roadway connecting two interstates, Dale Mabry Highway, and northern Pinellas County, Hillsborough Avenue will be part of the route of HART’s east-west MetroRapid service. Last month the MPO kicked off a study to look more closely at this vital corridor. The purpose is to assess conditions along Hillsborough Avenue for all modes of travel and develop short and longer-term alternatives. The study will pinpoint solutions to better balance the needs of all users traveling along this roadway, reduce the frequency and severity of crashes, and support economic development along the corridor, consistent with community values.